Investing in top performing core bond mutual funds 2013 may give consistent income in 2014. Top funds are Frost Total Return Bond Fund, USAA Intermediate-Term Bond Fund, Dodge & Cox Income Fund, etc. Investing in core bond mutual funds is essential for diversification. Core bond mutual fund invests in variety of investment grade debts. These funds can be an index fund or actively managed mutual fund. These funds invest in U.S. Treasuries, mortgage-backed securities, and investment grade corporate bonds). Some may invest in international bonds. 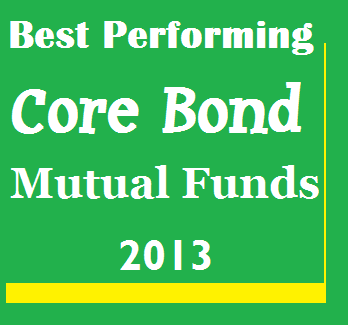 These best performing core bond mutual funds in 2013 are sorted based on its performance in 2013. Some of these best bond funds don’t have a sales load and transaction fee. Some funds do have a sales load. You can buy these bond funds for your brokerage account, retirement account, or 401k plan. Ranked with 5 stars rating by Morningstar, Frost Total Return Bond Fund utilizes its assets to purchase investment grade bonds. Jeffery Elswick is the fund’s manager since 1981. This top bond fund has a high yield of 3.90%. The total assets are $992 million. The class A fund has a sales load of 2.25%. The average effective maturity is 5.58 years. You can buy this best fund for your brokerage account with $2,500 initial investment and or your retirement account with $1,500 initial investment. You can purchase it from 35 brokerages such as Mid Atlantic Capital Corp, Schwab Retail, JPMorgan, ING Financial Advisers - SAS Funds, etc. 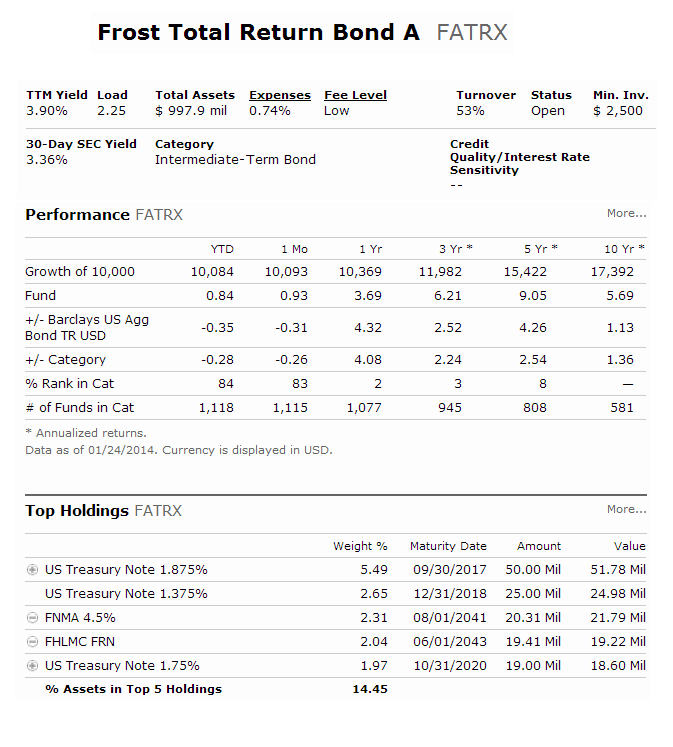 USAA Intermediate-Term Bond Fund invests mainly in a broad range of debt securities that have a dollar-weighted average portfolio maturity between three to 10 years. This top intermediate term bond mutual fund has a high yield of 4.38%. It is also popular among investors with $2.9 billion of assets. This no load fund has an expense fee of 0.65%. The top 2 holdings are Chubb FRN and Progressive Corp Ohio FRN. Morningstar has ranked it with 5 stars rating. This core bond fund has an average effective duration of 4.30 years. In 2013, it has a total return of 1.30%. 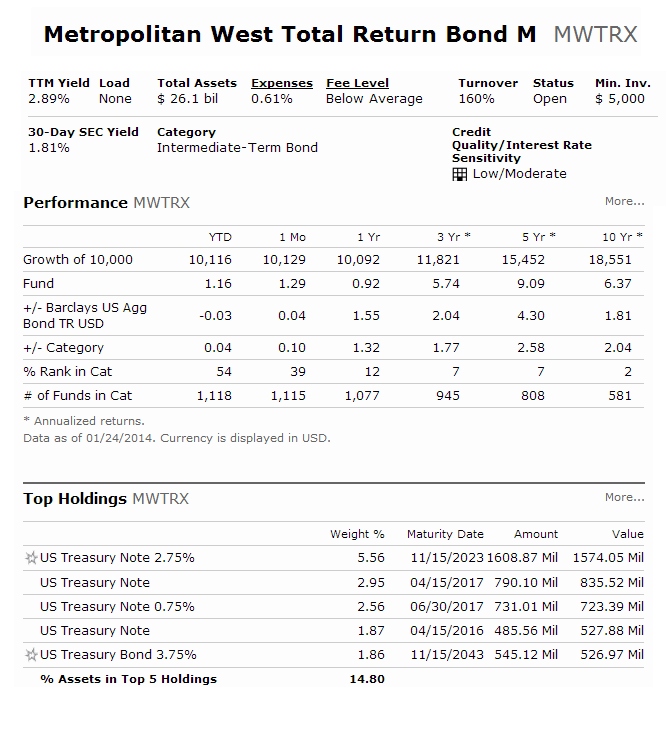 Metropolitan West Total Return Bond fund has total net assets of $26 billion. This no load fund has an expense ratio fee of 0.61%. The portfolio holdings turnover rate is 160%. This top core bond mutual fund has an initial investment of $5,000. The yield is only 2.89%. This best fund has a 5 year annualized return of 9.09%. It is ranked with gold and five star ratings by Morningstar. The current fund’s share price is $10.66. The average credit quality is BB. The top 4 bond sectors are Agency MBS Pass Through, U.S. Treasury, asset-backed, and corporate bond. 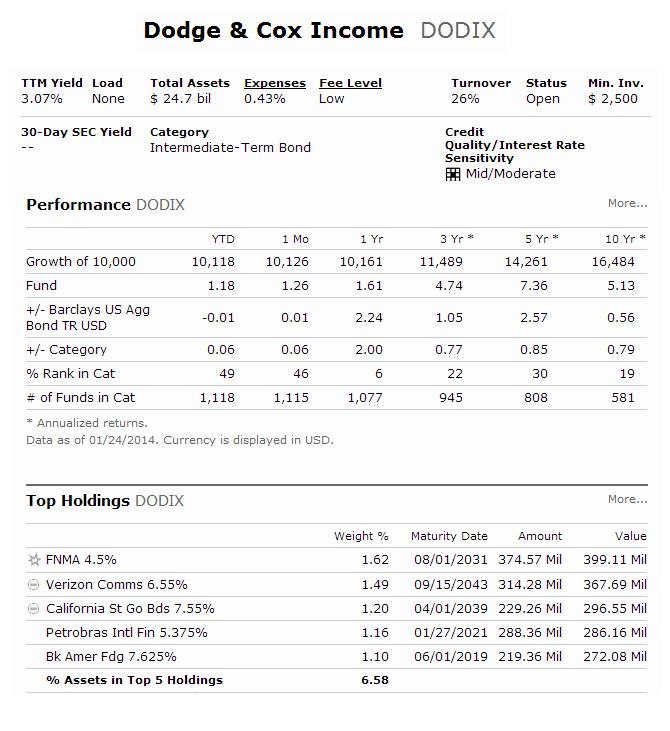 Dodge & Cox Income Fund is another gold star rated core bond mutual fund. This no load fund has a low expense ratio fee of 0.43%. Its holding turnover rate is only 26%. The current yield is 3.07%. The current NAV is $13.69. The top 2 holdings are FNMA 4.5%, and Verizon Comms 6.55%. 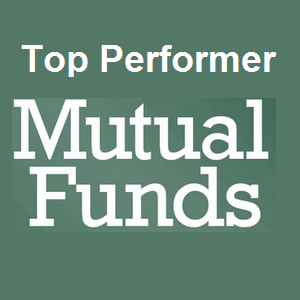 This top performing core bond mutual fund 2013 has returned 4.74% over the past 3 year, and 7.36% over the past 5 year. In 2013, the total return is 0.64%.